Healing the damage: The human body has an amazing resiliency, and will start to rebuild damaged lung cells as soon as you stop destroying them with cigarettes. Herbal smoking mixtures Coltsfoot is also one of the traditional smoking herbs that formed the basis of many smoking mixtures. Smoking herbs may help ease the transistion to becomming tobacco free by providing a healthier subsitute that does not contain the tar and additives of commerically produced tobacco. 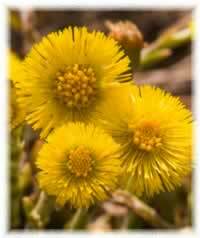 Coltsfoot helps soothe inflamed lung tissue, loosen secretions, and tones the lungs. White, Linda B. M.D. Ease the Nerves: Mildly sedating herbs can help to ease the nerves as well as quell nicotine withdrawal. Green oats are thought to have a sedative effect as well as a tonic effect on the nervous system. Passion Flower is another calming herb known for fighting anxiety and panic attacks that can be brought on by smoking cessation. Kava kava works as an antidote to the depression and mood swings that often occur when you stop smoking. Skullcap is a sedative herb that can help alleviate the anxiety that sometimes accompanies giving up cigarettes. Skullcap can be taken alone during the day, and combined with valerian at night to aid sleep. Valerian relaxes tense muscles, it can be used as a sleep aid if insomnia is one of your quitters symptoms.